Everyone knows about the standard bios you see in EVE: Damage types to use against different types of NPCs, the conversion of AUs into kilometers, and the like. Since the dawn of the New Order, an increasingly common type of bio is the mining permit. Agents of the New Order often have their own specialized bios, as well. They aren't utilitarian, like the "damage type" bios. New Order bios are worn with pride. Agent xxBLACK SKULLxx 929 is the CEO of the NEW ORDER DEATH DEALERS corp. Carebears often send him complaints when members of NODD punish them for their bot-aspirancy. 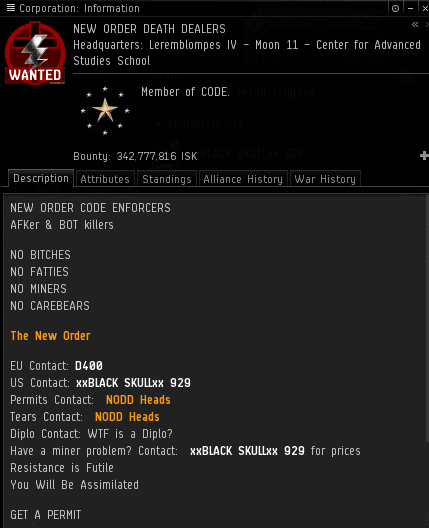 It's not surprising that an isk-obsessed miner would be angry about losing a ship. However, they're even more sensitive than that. The mere sight of a pro-Order bio is enough to provoke them. Witness, for example, an EVEmail with the subject line "Reality Check" from Ta'Shima Shaishi. She had a bone to pick with xxBLACK's bio, which demonstrated his love of the Code. When I glanced at the reference to P.J. Wodehouse, I was intrigued. Was a miner breaking new ground, comparing us to something other than Hitler? 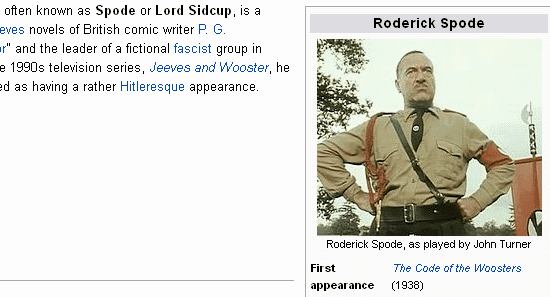 It was time for a Wikipedia check on this Sir Roderick Spode character. Alas, disappointment. It was just another dressed-up Hitler reference. A good effort, though. The Agents of the New Order are fearless. They support the Code and don't care who knows it. As we march forward from victory to victory, more and more highsec residents are taking a stand for the Order. It's not difficult to imagine that in due time, every man, woman, and child in highsec will have a pro-Order bio of some sort. Imagine, a 100% Code-compliant highsec! Isn't that a wonderful thought? Funny how Ta'Shima Shaishi has nothing better to do but write a self absorbed wall of text about xxBlack & NODD's allegedly 'self absorbed' mission statement! Must be ever so boring watching those mining lasers wind oh so slowly around and around. I think I have had the same BIO since this character was created. 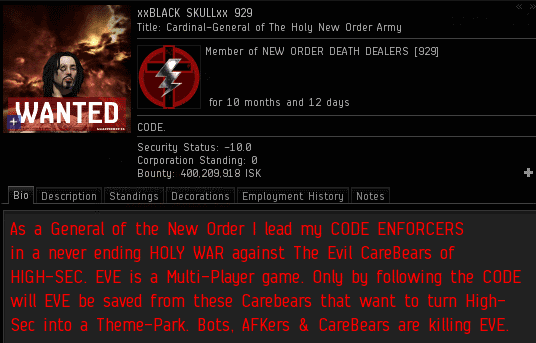 lets everybody know how I feel about "CareBears"
Just waiting on the trolls to show up. Mail me something in-game so I can get you on the naughty list. Thats it, 929. Don't make a wall-o-text reply...just find and gank the guy ingame. Its far more fun. That said, the anon is unlikely to send a mail to any agent ingame just so he can be put 'on the naughty list'. Wow, I don't get the issue, the BIO and corp description is what made me want to apply. Funny, intelligent, and promise of fun what else should a MMO be? "Bots, AFKers, and CareBears are killing EVE." Ta'Shima Shaishi demonstrates that a masterful command of the English language is no inoculation against carebearism and shedding tears over internet spaceships. if ime in a 0.5 sec do I have to pay and if so what protection will you offer from outher players and if its none than its just blackmail? Since when are regulatory fees indicative of dictatorships? If that were true, ever country in the world would be a dictatorship. The permit is not a protective arrangement. It is an agreement made for the betterment of highsec. The protection we offer is from bot-aspirancy, AFKers, botters and over-saturated markets. I can understand where you're coming from Lanaya, but i can also understand where the other person is coming from as well, is it a necessity to pay this if your only mining what you need to mine to get the resources for making certain things or to get the isk to purchase items, i can understand that bot-players and AFKers can be a problem for the sectors as well. i for one only mine when i need to mine but the argument i'm going to make is does it have to be paid and if it doesn't i can understand we leave ourselves open to the risk of getting destroyed but isn't this game meant to be a enjoyable experience and not one of being forced to pay for things that is openly free to do in the game. Read it and not really impressed. The Corp who wants to set a, 'levied tax', all be it, on miners is an idiot and if they carry on either the miners will go to town and hire their own thugs or the miners,in real life, will leave EvE when Star Citizen is released and EvE will be destroyed by their own making. When people aren't having fun in a game they leave and if they cause problems for people who just want to have a good time they will move on eventually. I'm pretty sure they don't like the idea of 'answering to the EvE maphia'. It's like having a job in real life. If your struggling to get on with people or your really hating the job you leave and get a new one. People may have invested time in the game but when it comes to it, it is just a game and there are always others to play, or, better ones may come along. There is a balance that some people don't understand until it's to late because they crossed the line. Only problem is they then blame everyone else for the problems they caused initially. I would also like to point out that this WILL indeed stop new people from wanting to play the game. If you want to have your secluded gameplay, carry on and do what you are going to do but eventually this will stop new people from playing the game and that's what really drives the game because they are the paid subscribers, not the regular players with billions of ISK.